We'll save our Republican friends a recitation of all the damage they did to themselves during the recent battle over the government shutdown and the debt limit. Anyone who can read a poll knows what happened. The shutdown kerfuffle has led to a significant improvement in the national political climate for Democrats. The House generic ballot, a national poll that measures whether those surveyed prefer a Democratic or Republican candidate in their local U.S. House race, was generally close over the summer, which was great news for Republicans: According to the Crystal Ball's Alan Abramowitz, these generic ballot surveys will have to show a double-digit lead 1 for the Democrats around Labor Day next year for them to get within striking distance of picking up the House. But since the shutdown, Democrats are getting closer to the kind of numbers that would put the House in play. The last nine generic ballot surveys listed on HuffPost Pollster 2 as of Wednesday morning read as follows: D+8, D+8, D+7, D+6, D+7, D+10, D+8, D+4 and D+5 -- that's an average lead of seven points. If the numbers look similar close to Election Day next year, Democrats would be poised for significant gains in the House, and the generic ballot would also indirectly indicate a national sentiment for retained Democratic control of the Senate. That said, the election is a long ways away, and Democrats would have to net 17 seats to win a majority in the House. Another polling average, RealClearPolitics, shows 3 Democrats with a six percentage point lead in the generic ballot. That's not all that much different than the 5.5 point edge Democrats held 4 in the RCP average on this exact date four years ago. Of course, back then the Democratic arrow was pointing down -- that lead was gone by December 2009. Now the Democratic arrow might be pointing up, and the GOP will start to hit the panic button if their numbers stay so poor. Republicans hope that Americans have short memories and begin to focus on things that will help their candidates in 2014: Namely, continued sloppiness 5 in the Obamacare rollout, a weak economy 6 (shown again by mediocre unemployment numbers released Tuesday) and a president with a middling approval rating (Obama's approval right now 7, which is mired in the mid-40s, isn't much different than it was right before the 2010 Republican congressional wipeout). However, we're far from sure that the Republican hopes are warranted: After all, if one argues that voter anger over the shutdown will fade, doesn't it also stand to reason that anger over Obamacare website snafus will also fade in the 12 months before the election? As we take a look at the Senate and the House, we've found positive developments for Democrats in both places. Some of our rating changes are directly related to the shutdown; others are because of new developments in fundraising, candidate recruitment and other factors. Louisiana and North Carolina are no longer toss-ups in the Senate; they now Lean Democratic. Other than the national dynamics, state-level issues are impacting the race in the Tar Heel State. Freshly-minted Gov. Pat McCrory (R) and the Republican-controlled state legislature have passed a series of conservative measures into law, such as implementing new voter ID regulations and placing new restrictions on abortion clinics. With the accompanying controversies over this and other legislation, McCrory's approval rating is stuck in the 30s 8, while only about a quarter of the state approves of the legislature. The main beneficiary of the tanking Republican ratings has been Sen. Kay Hagan (D), who is in a better position now to win reelection. With the leading Republican option in the race being state House Speaker Thom Tillis (R), a man directly involved in the unpopular actions of the General Assembly, Hagan's chance of survival has definitely improved. Also keep an eye on a Tea Party insurgent on the Republican side, physician Greg Brannon. Brannon recently won the support of Sen. Rand Paul (R-KY) 9, and could be a factor in the GOP primary. Whether Brannon is the next Paul -- or the next Sharron Angle or Christine O'Donnell, to name two of the more memorable Tea Party duds -- remains to be seen. Down in the Pelican State, Sen. Mary Landrieu (D) also finds herself in a more favorable situation. Not only has the national Republican brand suffered, but Rep. Bill Cassidy (R), her likely opponent, has not impressed with his fundraising. While Landrieu raised close to $1.4 million in the last quarter, Cassidy only could manage to pull in $700,000. She now has significantly more cash-on-hand than Cassidy ($5.8 million to $3.4 million). Cassidy also voted against the debt ceiling compromise, a vote that is perhaps aimed at shoring up his right flank, although he doesn't have a ton of competition there (Tea Partier Rob Maness is also in the race, but other, bigger-name Republicans have so far decided not to run). The “no” on the debt ceiling vote probably wouldn't help during a general election, although it's not guaranteed to hurt, either. Given her history of pulling out close elections, Landrieu has earned herself a small edge in the race. That leaves only two toss-up races in our ratings: Sens. Mark Begich (D-AK) and Mark Pryor (D-AR). So long as Joe Miller (R), the disastrous 2010 Senate nominee, doesn't win the Alaska Republican nomination, there are several Republicans who could give Begich a hard time in the general election. This is just a state that generally does not send Democrats to the Senate, period. One thing to watch here is if any credible third-party candidate emerges, which is common in Alaska. If so, Begich may not need to get over 50% to win. Elsewhere in the South, the open-seat race in the Peach State is close enough now that we are moving Georgia from Likely Republican to Leans Republican. It's reasonable to ask: Why are we moving Georgia, while keeping Kentucky, home of beleaguered Senate Minority Leader Mitch McConnell (R), as Likely Republican? There are a number of factors. With no incumbent in the Georgia contest, the GOP will spend a lot of money figuring out who its nominee will be in 2014. Meanwhile, non-profit executive Michelle Nunn (D) has no competition for the Democratic nomination, and she raised $1.7 million this past quarter, more than all of the Republican contenders save businessman David Perdue (R), though Perdue gave himself $1 million en route to raising $1.8 million. Nunn could very well have more money than her eventual general election opponent, and that individual could be Reps. Paul Broun or Phil Gingrey, each of whom are possibly too conservative and gaffe-prone for even conservative Georgia. Another factor: While we unfortunately do not have 2012 exit polling from Georgia, its demographics have been slowly changing in favor of Democrats, similarly to how Virginia and North Carolina have also been trending Democratic. Georgia remains the least Democratic of the three states, but it should become more open to Democrats over time. Perhaps Nunn -- and a poor Republican nominee -- will speed along the state's change. But Kentucky remains Likely Republican. McConnell has strengthened himself, oddly, with his role in bringing the shutdown to a conclusion. He reminded voters of the power he wields. Despite the fact that Secretary of State Alison Lundergan Grimes (D) narrowly outraised McConnell this past quarter, the Republican leader still has a huge fundraising war chest advantage. Another reason to remain skeptical of Grimes' (D) chances is to consider Kentucky's position in the Senate. The state already has a Tea Party senator in the aforementioned Rand Paul (R). Are they really going to add a second one by backing Matt Bevin (R), McConnell's primary opponent? Grimes might actually win against Bevin, and some Republicans are wise enough to recognize that fact. Out west in Montana, we're keeping that race rated as Leans Republican, as new Democratic recruit Lt. Gov. John Walsh is very much a political unknown at this point, having been elected as a part of a ticket and having never held office previously. However, it's worth noting that Rep. Steve Daines (R) has still not entered the Senate contest even though he is widely expected to. Like Cotton, Daines voted to end the shutdown and raise the debt ceiling; the nomination is basically his if he wants it, and all indications are that he does. He might be just delaying his entry into the race to put some distance between himself and the shutdown. Having shifted North Carolina and Louisiana into the Democratic column, our current ratings give Democrats a 50 to 48 edge in the Senate, with two toss-ups in Alaska and Arkansas. Democrats are now favored to retain the Senate, which is the price the GOP has paid for the government shutdown. They've got a lot of work to do to ultimately net the six seats they need to flip the Upper Chamber. Even though Republicans can do so simply by turning over seats in states that Mitt Romney won in 2012, they'll need the national environment to significantly improve for them in order to make their move. In our last update, three weeks ago, we wrote that Tuesday, Oct. 1 -- when the shutdown started -- was the best day for House Democrats this cycle. Let's add that the last three weeks were the best for Democrats in the House since 2008, an election when they added to what seemed to some to be an impregnable House majority (that was of course washed away just two years later). But as mentioned above, there's no guarantee that these lofty poll numbers will last. What they do provide Democrats, though, is a great tool to entice candidates into competitive contests. Democratic recruiters need to strike now, because the iron might not get any hotter. They're having some success, and here's a good example. Rep. Lee Terry (R, NE-2) is a frequent Democratic target: His district, containing Omaha in eastern Nebraska, provided Barack Obama with an electoral vote in 2008. Terry hung on in a tough race that year, and then had a surprisingly close contest in 2012 (while Mitt Romney won the district). National Democrats, who didn't really target Terry in 2012, now see the district as one of their better opportunities this cycle, and they tried to recruit an Omaha city councilman, Pete Festersen, into the race. Festersen initially balked, but then Terry made a boneheaded comment 10 about continuing to get his paycheck during the shutdown (he later apologized). Festersen, probably buoyed by not only Terry's gaffe but also a Democratic pitch pointing out their great national poll numbers, changed course and got in the race. We have had NE-2 rated Leans Republican consistently this cycle, although we were considering upgrading it to Likely Republican given the lack of a Democratic challenger. But with Terry's mistake and Festersen's entrance, we're keeping it right where it is. And if Terry ultimately loses, we'll be able to trace his troubles back to early October 2013. Despite the Republicans' lousy few weeks, we're not making a ton of changes to our House ratings this week. But, like in the case of Terry's seat, the shutdown combined with some potential good Democratic recruiting are keeping some seats in competitive categories. Note: To see the full Crystal Ball House ratings, click here 11. For instance, Politico's Alex Isenstadt reported 12 that Democrats are feeling good about a handful of new recruits in some targeted districts. One is Joe Bock, a University of Notre Dame official, who appears set to run against first-term Rep. Jackie Walorski (R, IN-2). IN-2, like NE-2, was unexpectedly close last year. Also like NE-2, we were preparing to move this seat to Likely Republican before the shutdown. It too stays in the Leans Republican column. Another notable Democratic recruit is James Lee Witt, who directed the Federal Emergency Management Agency under President Clinton. He's likely to run in AR-4, which Cotton is vacating after just a single term. To be cautious, we're moving this seat back to Likely Republican, although state House Majority Leader Bruce Westerman (R) remains a heavy favorite to win the seat, where Romney won more than three of five votes in 2012. A more competitive race just opened up elsewhere in the Natural State, though: Rep. Tim Griffin (R, AR-2) announced his retirement 13 earlier this week. This district is more favorable to Democrats -- Romney only won 55% there in 2012, and it contains Little Rock, a big source of Democratic votes. This race now Leans Republican; we'll have to wait and see how the respective Democratic and Republican fields shake out; on the Democratic side, former North Little Rock Mayor Patrick Henry Hays (D) appears likely to run (he gets our nomination for best candidate name of the cycle so far). Also lurking are several other Democrats, including ex-Lt. Gov. Bill Halter (D), who briefly ran for governor earlier this cycle. Republicans considering the race include former Bush 41 administration official French Hill. Retirements are a vital piece of any possible Democratic takeover, and Republicans have so far seen more of their members opt for the exits 14. More may be coming, which could be another consequence of the debt ceiling debacle. Two possibilities we've heard rumblings about are Reps. Frank Wolf (R, VA-10) and Buck McKeon (R, CA-25). Watch for possible Democratic retirements, too -- the seats of Reps. Collin Peterson (D, MN-7) and Nick Rahall (D, WV-3) would likely go Republican whenever they decide to step aside, although Democrats are confident that they will wait for a future cycle to hang ‘em up. If Peterson runs, he should be safe, but Rahall faces a tough challenge from a party-switcher, state Sen. Evan Jenkins (R). That seat, where Romney won 65% (!) 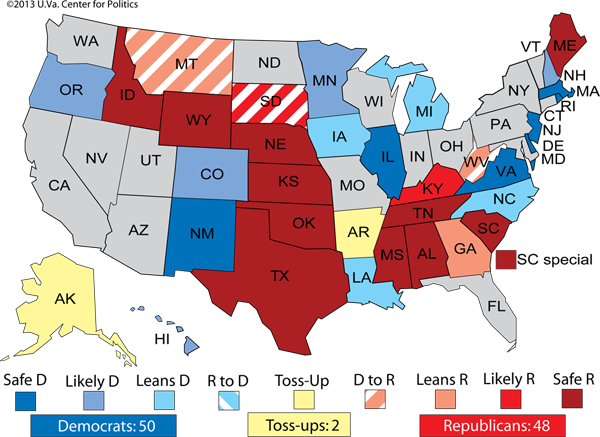 of the vote, is edging closer to toss-up territory. Another seat that has become very competitive is that of the late Rep. Bill Young (R, FL-13), who sadly died last week shortly after announcing his retirement. Obama narrowly won this Tampa/St. Petersburg-area seat last year, and Democrats are hoping that Alex Sink, the former state chief financial officer who narrowly lost the 2010 gubernatorial race, will run. Attorney Jessica Ehrlich (D), who ran against Young in 2012, might not want to step aside, though. There's a potential cast of thousands on the Republican side, which is led by two former local mayors, Rick Baker and Frank Hibbard, as well as the late Young's son (Bill Jr.) and widow (Beverly). Young is being laid to rest Thursday 15, but expect the race to heat up soon thereafter. A special election to fill the Toss-up seat, which will probably be held early next year, will generate tremendous national attention. On the other side of Florida, we've long identified Rep. Patrick Murphy (D, FL-18), who beat the fiery ex-Rep. Allen West (R) in a vicious race last year, as perhaps the most vulnerable Democratic House incumbent in the country. We no longer believe that: Murphy has largely made all the right moves in his first year in Congress, and he's got an impressive $1.4 million cash on hand. Meanwhile, a field of nondescript Republican challengers is struggling to get traction, and a top potential Republican recruit, 2012 FL-22 nominee and former state House Majority Leader Adam Hasner, appears to be leaning against running. This race now Leans Democratic. Finally, keep an eye on MI-7 as a possible bellwether for 2014. Rep. Tim Walberg (R) has always been more conservative than his district, and he was Tea Party before there was a Tea Party. In 2004, Walberg lost a primary to the more moderate Joe Schwarz (R). Walberg came back to beat Schwarz in 2006 and then narrowly defeated a weak Democratic candidate. Two years later, Mark Schauer (D) beat Walberg, and then Walberg stormed back to win in the 2010 wave. Walberg voted against ending the shutdown, and Democrats like their candidate, ex-state Rep. Pam Byrnes (D). This is the kind of marginal district (51%-48% Romney) that Democrats need to capture to win the House, and Walberg's weak performances over the years (just 53% against a no-name opponent in 2012) give Democrats hope here; we're now calling it Leans Republican. One important thing to keep in mind regarding all these recruits from both parties: At this point in the game, we're focusing more on the potential of these candidates; some will warrant the attention they've gotten from national operatives and analysts, and some will not. Watch their fundraising. For Democrats, a couple early recruits show the two sides of this coin. In CO-6, Andrew Romanoff (D) is set to challenge Rep. Mike Coffman (R), and Romanoff has proven his mettle by keeping pace with Coffman's fundraising -- both have more than $1 million cash on hand for what will be a bruising contest. On the other hand, Democrats have trumpeted the candidacy of Michael Eggman (D) against Rep. Jeff Denham (R, CA-10), but Eggman has raised little money, and Denham holds a cash-on-hand advantage over Eggman of about eight to one. A Democratic wave could still carry a candidate like Eggman over the finish line -- fundraising is not the be all and end all of a congressional race if national winds are blowing strongly one way or the other -- but Eggman's probably going to need a lot of help if he's going to have a shot to win that race. To sum it up, the race for the House is getting more interesting by the day. Republicans remain favored to retain control -- call it Likely Republican in the parlance of our ratings -- but the shutdown has shaken things up. At this point, we're now expecting a small Democratic gain, instead of the small Republican gain we were forecasting earlier in the cycle. That prognostication is likely to change once Congress tackles the same old fiscal deadlock in January and February. Have Republicans learned anything from their October debacle? We shall see.